The Logic of English® Essentials curriculum is a complete course in the structure of written English that uses proven, research-based methods to teach students ages 8 to adult to read, spell, and write successfully.Easy to use, engaging, and fun, Essentials improves the spelling and reading skills of all learners by providing linguistically accurate phonics instruction, spelling analysis, fluency practice, morphology and vocabulary development, grammar, and composition.Essentials gives students the tools to understand the spelling of more than 98% of English words! Apologia’s newest curriculum, Exploring Creation with Health and Nutrition, covers what maturing students need to know to help them make the best choices they can for themselves as they become young adults. Health is about stewardship: managing what you have as well as you can. This 15-module course, which includes both a hardcover textbook and a spiral bound notebook, covers the physical, nutritional, emotional, and spiritual aspects of growing into a healthy adult. The answer key is included in the Book Extras online.Recommend age: grades 8-12 (see Parental Note). 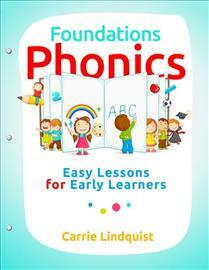 Logic of English™ Foundations teaches children age 4-7 to read real books without guessing or memorizing sight words while developing their writing, spelling, and language skills.In Foundations students gain phonemic awareness, learn to read and write the 75 basic phonograms, and increase reading fluency through structured but playful activities. The innovative Rhythm of Handwriting™ method aids students in developing fluid handwriting. Step by step, students grow as readers, moving from phrases to sentences to paragraphs to books.Using evidence-based reading instruction methods, Foundations combines multi-sensory learning with the latest in linguistic research to provide students the best possible foundation for education: strong reading and writing skills.The four sequential levels of Foundations make it possible to adjust the schedule and pace of the curriculum to the needs of your students. Typically children complete the four levels over two or three years. Explore the fascinating field of anatomy and physiology in this engaging elementary science course! 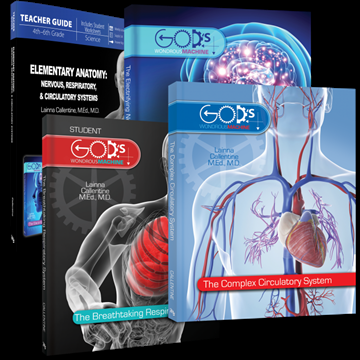 In Elementary Anatomy: Nervous, Respiratory, Circulatory Systems, students in grades 4-6 will study the nervous, respiratory, and circulation systems in the human body as they discover how the brain communicates with the rest of the body, how we breathe, why our circulation system is essential, and so much more!Through engaging text, beautiful illustrations, worksheets, and optional activities, your student will examine awesome examples of God’s creativity in both the design and precision of human anatomy, reminding them they are indeed fearfully and wonderfully made! We tend to think being “stressed out” is a normal state of affairs, and that contentment means sitting back and just bottling things up. For the Christian, however, contentment is something we must apply, work at, and make our own in every circumstance, because anxiety and frustration are not neutral behaviors.It is certainly easier to just go with our natural impulses when times are “annoying” or when times are very hard, but contentment is an important part of our Christian life. Even the apostle Paul had to “learn” contentment. So we shouldn’t wonder why we’re still in spiritual kindergarten—repeating the same lessons over and over again—if we haven’t given ourselves to study contentment.Thankfully, every test God gives on contentment is open book (even the pop quizzes!). 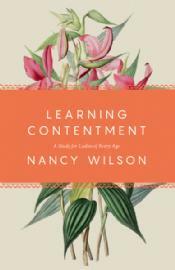 In Learning Contentment, Nancy Wilson looks to the Bible and Puritans like Burroughs, Rutherford, Watson, and Spurgeon to help us develop the practical, spiritual strength and the perspective that comes from contentment’s deep satisfaction with the will of God.This encouraging little book includes concise explanations, application questions and assignments that will involve and challenge everyone, and lots of biblical wisdom for individuals and groups.